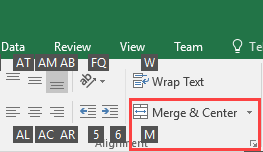 There are a few ways to use the Merge & Center command in Excel. 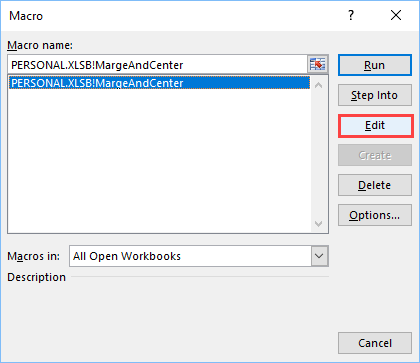 In the first method, you can use the access the Merge & Center, or any other command from the Ribbon, using a keyboard. If you press Left Alt, Excel will display letters on the ribbon to select one of the tabs or icons in Quick Access Toolbar. If you press h, the program will choose the Home tab. You have to do it, even if you are currently inside this tab. You have the tab selected. Now, press m to access the Merge options list. The last letter is by pressing the letter c.
The full shortcut is Left Alt >> h >> m >> c pressed sequentially. Instead of using this long shortcut, that’s not only hard to insert, but also hard to remember, there is another, a faster method using a very similar way. First, add a command to Quick Access Toolbar. Hover the mouse cursor over the Merge & Center command and use the right mouse button. Now, click Add to Quick Access Toolbar. You can notice that a new icon appeared on the Quick Access Toolbar. When you press Left Alt, the command (in my case) is at the number 8. Now, Instead of four steps, you can do it in two. So far, we were accessing the command using keyboard buttons pressed sequentially. But you can also record a macro that will use the command and apply a keyboard shortcut to it. You can record a new macro by clicking an icon in the bottom-left corner. The second way to record a macro is by clicking View >> Macros >> Macros >> Record Macro…. A new window will appear. Name the macro. Click inside the box under the Shortcut key: and press Shift + q. This will assign Ctrl + Shift + q to our macro. Now, click the Merge & Center command and stop the macro. Click View >> Macros >> Macros. A new window will appear. Select the name of the macro and click Edit. This is how our code looks like. The macro sets a few things inside the code. But we can keep it as it is. You can use it by selecting cells and then pressing Ctrl + Shift + Q. The disadvantage of this method is that with a macro, the Ctrl + Z shortcut (undo changes) doesn’t work. 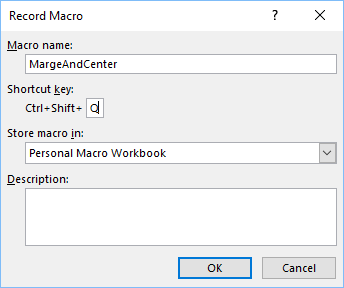 But, if you can, you can create the second macro, with a different keyboard shortcut and Unmerge Cells command, which you can find in the same place as the Merge & Center command.